This is a Christian themed page, focusing on the common symbol associated with Christian prayer: praying hands. Prayer in the New Testament is presented as a positive command (Colossians 4:2; 1 Thessalonians 5:17). Christians are challenged to include prayer in their everyday life, even in the busy struggles of marriage as it brings people closer to God. Above you see a sample title graphic showing how a web site title might look. A blank of the title clip art is in the .zip file below. If you don't have a graphic program capable of doing that, e-mail me and I will do it for you as time allows. Below you will find the graphic divider and bullet designed for this page. An e-mail button is included as shown on the page in the zip file. Christian Praying Hands coordinating navigation graphics that could be placed at the bottom of each page if appropriate are also included. Prayer is frequently found in the gatherings of any church, offered frequently throughout the worship service with the Lord's Prayer taking its place as the anchor - a common ritual in each gathering. There is no one prayerbook containing a set liturgy used by all Christians; however many Christian denominations have their own prayerbook. The prayer is supposed to receive the full mental and spiritual effort of those involved, whether speaking or listening. Even if a standard wording is used, mechanical recitation is discouraged. Christian teachings indicate that the lack of blessings in life results from a failure to pray (James 4:2). In the early church praying three times a day in private was the common practice. This private practice would later develop into family devotions and personal "quiet times." In the gospels, Jesus said that when you pray, you should not try to to impress people with your piety. For some Christians, union with God is a paramount purpose of religion. Christians believe that God is seeking union with His children. Prayer is the expression of the soul seeking to speak with God. Font used for the sample title and buttons above is called: "Squeaky"
To save, you may download the .zip file which includes the Praying Hands Christian graphics, clip art, instructions and HTML template. Do not link to the graphics on this page! Please note that this set is free to use on personal websites only (donations are always appreciated). Those sites that hope to generate income (business site) there is a one time $10 minimum requested donation payable through Pay Pal. 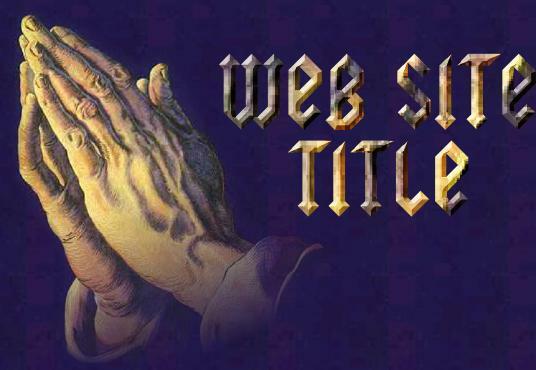 Christian Praying Hands web theme set courtesy of Crystal Cloud Graphics.